The Elevator Canvas is a Business Model Canvas, meant for pitching to VC’s. I am passionate about BMC’s, and when I read the following passage from chapter 2 of the Venture Deals Book, I thought such a canvas will be useful for me. And here I am releasing the Canvas for everyone. The objective of the canvas is to provide VC’s with a snapshot of the pitch. It is called the Elevator Canvas because the VC can get the whole picture in 30 seconds. This is not meant to replace the Elevator Pitch. (Nothing like meeting and pitching the VC in person). The canvas focuses the entrepreneur on to the things VC’s are interested in. Also the entrepreneur is forced to reduce each thing to a sentence or two. The Elevator Canvas is not to be confused with, the Minimum Viable Canvas, Lean Canvas, Business Model Canvas. Each has its own purpose. The Elevator Canvas is for pitching to VC’s. The Minimum Viable Canvas is for Product Development. 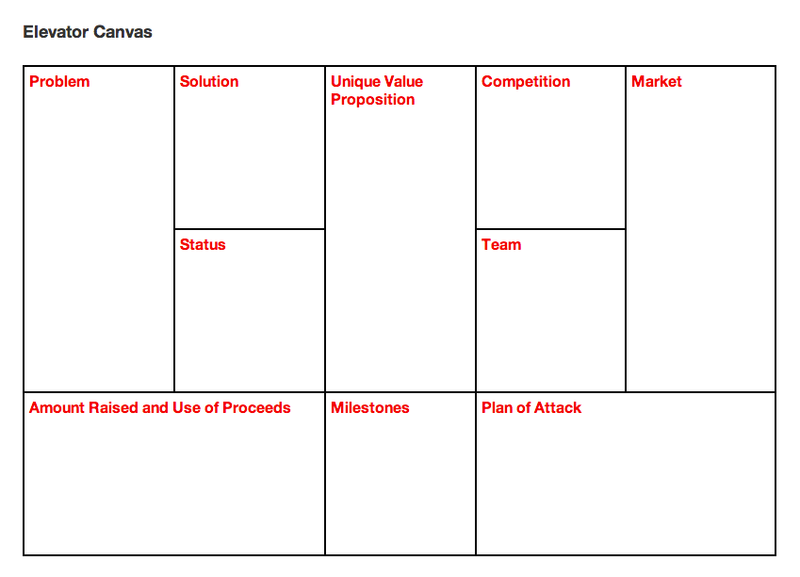 The Lean Canvas is for early stage startups. The Business Model Canvas is for growth phase startups.